A recent report published by Infinium Global Research on gas detection equipment market provides in depth analysis of segments and sub-segments in global as well as regional gas detection equipment market. 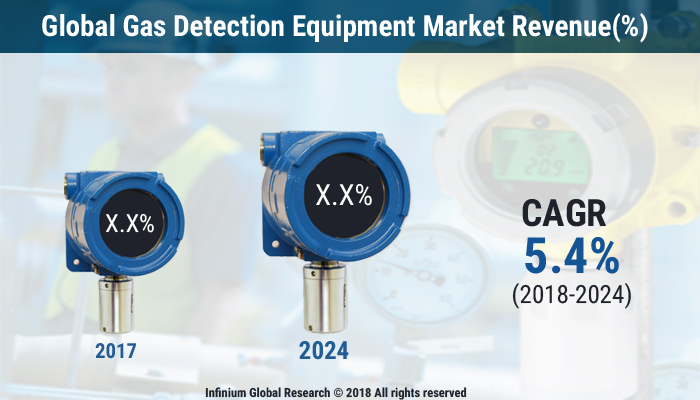 The study also highlights the impact of drivers, restraints and macro indicators on the global and regional gas detection equipment market over the short term as well as long term. The report is a comprehensive presentation of trends, forecast and dollar values of global gas detection equipment market. According to report the global gas detection equipment market is projected to grow at a CAGR of 5.4% over the forecast period of 2018-2024. A gas detector is a device that detects the presence of gas in the specific area as a part of safety system. Gas detection equipment is mainly used to detect gas leak with a control system so the process of gas detection can be automatically shut down. These detectors use wireless technology such as Bluetooth, Wi-Fi, Wi-MAX, and ZigBee to connect to a smartphone, tablet, or desktops. The basic principle of this equipment is to identify the presence of harmful gases in the environment and raise an alarm to prevent accidents. In addition, gas detectors are mostly battery operated devices and are found in commercial spaces for safety purpose. Applications can be found in refineries, industrial plants, automobiles, wastewater treatment facilities, and household activities. Rising safety concerns in industrial as well as commercial spaces are the major factors driving the growth of the gas detection equipment market. In addition, wireless gas detection systems have also proven themselves in oil and gas applications to provide increased safety and cost savings in exploration, refining, plant improvements, and retrofits. This in turn is anticipated to drive the gas detection equipment market over the forecast period. However, high response time of the gas detectors with the change in the concentration of the gas and intense competitive market players are the factors hampering the growth of the gas detection equipment market over the years to come. Furthermore, increase in demand to detect gases and safety for medical and household sector are anticipated to provide huge growth opportunities for the key players in the gas detection equipment market. On the other hand, smart gas detectors are being manufactured by focusing on development of innovative wireless technology and rapid integration of big data and artificial intelligence. For instance the application in remote monitoring are Network capable application Processor that is connected only to sensor smart transducer interface module that can perform remote process such as monitor the temperature of a water bath in a chemical processing plant through the Internet .This in turn has opened several doors of opportunity for the growth of gas detection equipment market over the upcoming years. Among the geographies, Asia Pacific dominated the global gas detection equipment market followed by North America. The growth in North America is mainly due to the government regulations concerning workplace safety. Moreover, countries like India and china are anticipated to show rapid increase in demand owing to the rise in number of investment in chemical, petrochemical, power, steel and oil & gas sectors. On the other hand, tremendous infrastructure development undertaken by the developing economies such as Middle East, India and Brazil are expected to drive the gas detection equipment market in the near future. The prominent players identified in the gas detection equipment market are Honeywell Analystics, Sierra Monitor Corporation and General Monitors. In addition, Honeywell Analytics manufactures a full and comprehensive range of products has set a benchmark for the industry in terms of quality, functionality, and ease of use. The report on global gas detection equipment market covers segments such as, sensor type, end-use industry and power source. On the basis of sensor type the global gas detection equipment market is categorized into infrared sensors, electrochemical sensors and metal oxide semiconductor (MOS) sensors. On the basis of end-use industry the global gas detection equipment market is categorized into oil & gas, water treatment, semiconductors, mining, building automation and construction and power generation/utilities. On the basis of power source the global gas detection equipment market is categorized into battery-powered gas detectors, hardwired gas detectors with backup batteries and hardwired gas detectors without backup batteries. The report provides profiles of the companies in the global gas detection equipment market such as, Honeywell International Inc, Siemens AG, Riken Keiki Co. Ltd, SE Electronics, GE Measurement & Control Solution, Schauenburg Group, RAE Systems Inc, Industrial Scientific Corp, Troloex Ltd and ESP Safety Inc. The report provides deep insights on demand forecasts, market trends and micro and macro indicators. In addition, this report provides insights on the factors that are driving and restraining the global gas detection equipment market. Moreover, IGR-Growth Matrix analysis given in the report brings an insight on the investment areas that existing or new market players can consider. The report provides insights into the market using analytical tools such as Porter's five forces analysis and DRO analysis of gas detection equipment market. Moreover, the study highlights current market trends and provides forecast from 2018-2024. We also have highlighted future trends in the gas detection equipment market that will impact the demand during the forecast period. Moreover, the competitive analysis given in each regional market brings an insight on the market share of the leading players. This report will help manufacturers, suppliers and distributors of the gas detection equipment market to understand the present and future trends in this market and formulate their strategies accordingly.